Image Size: 29 1/2"w x 14"h.
Bargemen, watermen and deck hands alike make ready for nightfall as cabin lanterns and anchor lights wink across the harbor. The "Cohota," newly arrived from Boston, rides at anchor with wet sails drying in the Pacific breeze wafting across Yerba Buena Cove. To the northwest, the sun slips silently behind Telegraph Hill, enfolding the infant city of San Francisco in a gold rush twilight. The splendor of early America, the glory of 1800s sea-faring ships and the talent of one of today's most accomplished and respected marine artists evoke an exciting time in our history. When a child has a father and grandfather who are both well known illustrators, it is likely the offspring will also become an artist. And when a boy starts to sail at the age of six, it is also likely that the artist might choose the sea and sailing ships as his subject. Such was the case for Christopher Blossom, who, by the time he left the Parsons School of Design and Robert Bourke’s Design Studio, could visualize a finished boat from only its plans—and draw the craft from any angle. Before Blossom was twenty, he had sailed under square rig aboard the brigantine Young America. Known for his complex, detailed compositions of ships at sea, Blossom combines his appreciation for the beauty and the menace of the sea with his love of maritime history and ship construction. Before Blossom paints a vessel, he is likely to study the ship’s blueprint to learn about it hull design, length, tonnage and deck layout. Blossom’s historically accurate ships and harbors are combined with color, light and composition to capture the mood of a voyage and convey the essence of the seafaring experience. At the age of twenty, he won a Gold Medal at the Society of Illustrators Scholarship Exhibition. His dual vocation of experiencing the sea and then painting both nautical history and some of the greatest modern places to sail, was truly launched. Blossom became both a charter member and an artist of the American Society of Marine Artists, serving as its president from 1983 to 1986. 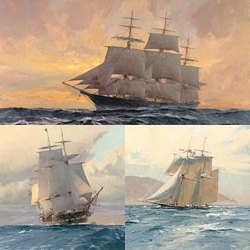 His awards include a Gold Medal from the National Academy of Western Art for his painting of ships in Monterey. Saluted as an undisputed master, Blossom has exhibited his art at the Gilcrease Museum, the Colorado Museum of History, the prestigious Prix de West Invitational and the Artists of America show. Blossom continues to achieve artistic honors including the Robert Lougheed Memorial Award at the 2001 Prix de West. Almost the only time he isn’t painting is when he is sailing, visiting ports of call in Maine, Connecticut, Rhode Island, Maryland, the Bahamas, California and Washington state. Blossom, who recently spent a year sailing around the Caribbean with his wife and two sons says of his love, "It’s not a hobby, it’s a way of life. When I look at the ocean, I get the same feeling pilots must get when they look to the sky."